It was a fantastic day full of racing and emotions, with 26 heats scheduled all has been done impeccably, under the sign of entertainment and fun at the South Garda. Among the names that have left the mark today are two Junior Rok drivers, the Swiss Bizzozero and the Italian Bosco, able to impose themselves in two heats. Even Polish Szczurek, in the Senior, managed in the unlikely attempt to win twice. Among the welcome attendances in the Rok paddock, besides the big ones already present (Barrichello, Fittipaldi, Trulli and Badoer) there was Ralph Schumacher. Tomorrow all those who will not have the chance to follow the races at the track, will have all finals live starting from 12.40 in tv streaming. Today Junior Rok has confirmed to be one of the most aggressive categories on track. 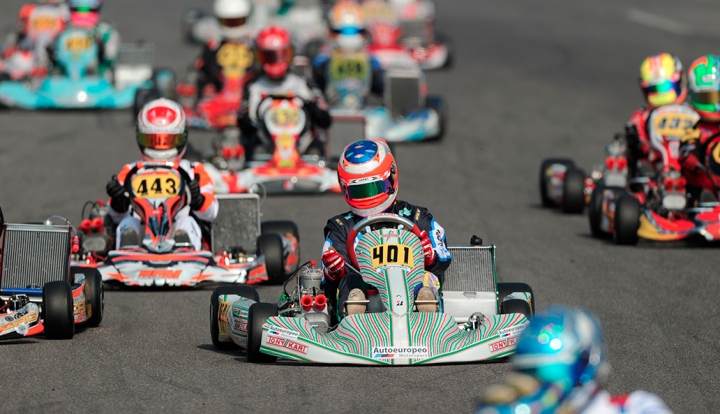 The cadet category of the Rok has played six heats, all uncertain, won by Franzoso and Sabella who had achieved already the success, yesterday. Two heats on the same day were won, as said above, by Bizzozero and Bosco, with the latter completing the third success, considering the one he won yesterday. Only tomorrow morning the situation will be summed up with the last three remaining heats, necessary to define the starting grid of the final. With two spectacular wins, in the same heats, the Polish Szczurek got a position among the favorites, like the Szyszko brothers. Today Szyszko name did not miss the top of one of the rankings, in fact Maciej won the first qualifying race of the day. The supremacy of the Polish Rokker drivers was sealed also by Mila's victory in the other heat, indicating that tomorrow's accounts will have to be made with these drivers. The last heat went to the Italian Carenini, former Junior Rok Champion and nominated for a successful place in the middle of the Polish army. After Gaglianò’s control in the first day, poleman and winner of a heat, today’s two races was gained, overwhelmingly at the summit, by D’Abramo, author of two victories. Gaglianò was the unlucky protagonist of the first heat, but he then redeemed himself in the second one, holding the rhythm of the winner D'Abramo. Good performance also for Russo, Brigatti and Mazzotti, still a little detached from the two-top drivers. Albanese has confirmed his state of grace even today, dominating the first heat, but in the third one he was stopped by a formidable Buran. The latte was particularly unlucky in the initial races, in fact he withdrew both times while struggling for success. Marcon, champion in charge, was leader in the second heat, also thanks to a double penalty occurred to Cinti and Milell, who got the first two positions. Rubens Barrichello showed off all his class, closing in second position with a race all in the attack. The former F1 driver also today performed a good comeback, with nine overtakings and a play at the best rhythm.